This question is about the use of .Net Standard in a Xamarin.Forms project targeting iOS (but also Android). Please excuse my frustration but with the transition between PCL to .Net Standard I feel we are in a kind of limbo with very little working out of the box and very little information on how to deal with edge cases or not-even-so-edgy-cases. I've read (many)(different) guides and the vocabulary is mildly confusing as well as the fact that you need to edit your .csproj files will small undocumented hacks to work around things that aren't working out of the box yet (many NuGet related issues that aren't approached in the Hi! This is how you convert from PCL to the great .Net Standard happy videos). If I understand well, at this point, my new core application project is a .Net Core project. 4. Added my core application project as a reference to my iOS project. Question here: What type or project is the iOS project here? .Net Framework project? Or something else? How do/can I create a .Net Core/Standard iOS project? But it does not seem to work, at least not for my iOS project using Visual Studio for Mac. Any suggestion on how to solve this? Or how am I supposed to set up my iOS app project to use the .Net Standard project? In what follows I am assuming that your .NETStandard project also uses PackageReferences since you mention that you created a .NET Core project. If you want to avoid a lot of NuGet dependencies you could switch to using PackageReferences in the iOS project instead of using a packages.config file. If you are using VS for Mac then currently you will need to add one PackageReference into the .csproj manually by using a text editor. Once the project has a single PackageReference then VS Mac will use PackageReferences in the project file from then on. Using the RestoreProjectStyle MSBuild property does not currently work in VS for Mac but will in a later release. and perform a fair amount of NuGet restore/clean/rebuild. Also make sure to use a rather new Mono version (Mono 5.4.1.6 works, Mono 4.8.0 does not). Hi @mattward and thank you for your prompt answer. The one I want to add is Microsoft.Rest.ClientRuntime (and its dependencies). Have I missed something? Do I need to create a ".Net Core"-iOS project, if so how? Ok thank you, good to know. Ah, OK. So the problem is that the assemblies are not in the .app. They seem to be in the bin folder. Using a packages.config file or a PackageReference should not affect this. I can reproduce the Microsoft.Rest.ClientRuntime.dll not being added to the .app if the .NET Standard project has no code that uses any types from the Microsoft.Rest.ClientRuntime.dll. The iOS project I have is using a class from the .NET Standard project so the .NET Standard project assembly is added to the .app. When the .NET Standard project has a class that uses say Microsoft.Rest.BasicAuthenticationCredentials then, on rebuilding, the .app contains the Microsoft.Rest.ClientRuntime.dll. In my case presumably the iOS linker is seeing that the assembly is not used and is not including it. I really appreciate that you take the time to help here. My iOS application references the .Net Standard. The .Net Standard project does use Microsoft.Rest.ClientRuntime.dll, which is the reason why it crashes (since the dll is missing). Microsoft.Rest.ClientRuntime.dll library is used by the code that is autogenerated by autorest, if that makes any change. I have tried to create a new BasicAuthenticationCredentials but did stumble on the same error. First commit (561a5c2d1223b4701d39a4701b0198f72d60786f) just creates a new Microsoft.Rest.BasicAuthenticationCredentials in a PCL project that is referenced by the iOS app. Second commit (0bf6af1dd344c995d51aa11c301130848352b874) upgrades from PCL to .Net Standard using @JamesMontemagno's guide . Third commit (c30f133313c8f1c29e206e8d403eca9d313483c5) adds the PackageReference as suggested above. Can you see any difference in settings with your own repro-project? I tried your solution and built it locally and an .app was created in the NetStandardiOSLinkError/iOS/bin/iPhoneSimulator/Debug/device-builds/iphone10.3-11.0 directory and it contains the Microsoft.Rest.ClientRuntime.dll. The app also runs in the simulator without crashing. 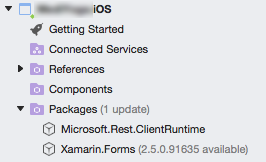 There are a few problems in the iOS project but it looks like they have no affect on my machine (the iOS project does not need to explicitly reference the Xamarin.Forms dlls nor import the Xamarin.Forms .targets and .props if you are using PackageReferences). I am however most likely using different versions of Xamarin.iOS, VS for Mac and Mono. Can you post the information from VS for Mac's About dialog - show details? Copying the details I did then realize that I was using Mono 4.8.0 instead of Mono 5.4.1.6 to build... (Changing back and forth for old legacy projects). It seems to work just as you describe when using Mono 5.4.1.6. Thank you for your help, sorry to have disturbed you for such an error. "Error Could not link assemblies. Reason: Object reference not set to an instance of an object"
How can i fix this..
Hi @ThibaultD @mattward , Please let me know how you fixed it since I am getting the same error. I'm unable to compile my Xamarin.iOS project. This project was recently migrated from .NET Standard 1.4 to a .NET Standard 2 project in VS2017 on Windows connect to the Mac Agent. warning MSB3276: Found conflicts between different versions of the same dependent assembly. Please set the "AutoGenerateBindingRedirects" property to true in the project file. Consider app.config remapping of assembly "System.Runtime, Culture=neutral, PublicKeyToken=b03f5f7f11d50a3a" from Version "4.0.0.0" to Version "4.0.20.0"  to solve conflict and get rid of warning.rning.